Barbara Billingsley died this morning. She was the quintessential TV mom, with her shirtwaist dresses, pumps and pearls, and countless kids grew up listening to her wisdom. Here she is in a TV guide spread from 1961. Imagine doing your vacuuming in that jumpsuit on the left. Barbara Billingsley Mortensen, homemaker both on and off television, likes to dress up to her role. To the housewife whose slacks become her uniform Barbara offers this advice: "There are occasions when a homemaker feels and looks better if she's dress up. No matter how hectic things get, try to keep yourself up. 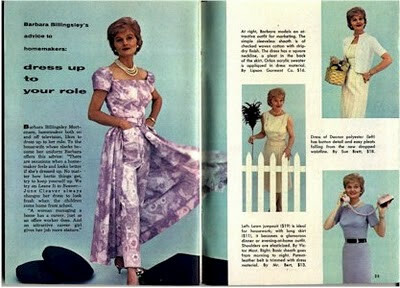 We try on Leave It To Beaver - June Cleaver always changes her dress to look fresh when the children come home from school. "A woman managing a home has a career, just as an office worker does. And an attractive career girl give her job more stature." At right [top right photo], Barbara models an attractive outfit for marketing. The simple sleeveless sheath is of checked woven cotton with drip-dry finish. The dress has a square neckline, a pleat in the back of the skirt. Orlon acrylic sweater is appliquéd in dress material. By Lipson Co. $16. Dress of Dacron polyester [middle right photo] has button detail and easy pleats falling from the new dropped waistline. by Sue Brett. $18. Lawn jumpsuit [left photo] $19 is ideal for housework; with long skirt ($11), it becomes a glamorous dinner or evening-at-home outfit. Shoulder are elasticized. by Victor Most. [Bottom right photo] Basic sheath goes from morning to night. Patent leather belt is trimmed with dress material. By Mr. Bert, $13. I didn't see that Barbara Billingsley has passed away - such a classy icon of a kinder & gentler era. Love the TV Guide spread! I'm sharing with my Twitter friends. Ms. Billingsley looks so trim here (thanks to the girdle and stitched-cup bra she's wearing underneath). Remember "Leave It to Beaver" was a fantasy. Changing clothes to look "fresh for the children"? Yow! Wouldn't the flowery little jumpsuit and heels be a fine outfit for mopping the bathroom and poop-scooping after the dog? This look epitomizes the decorative little vacant-minded housewife, the role the feminists of the 1970s rebelled against. It wasn't so much a kinder era as a more restricted, repressive, tied-down era. I'm grateful that it's over. Pretty clothes aside. women had the same rights they have now, this was an era when it didn't take two people to work to support a family. When children didn't kill children at school, when there were morals, true american pride.. You as a simple liberal feminist wouldn't be satisfied in any lifetime...however,,,a lady can live in any era. "Vacant minded", "restricted", "repressive", "tied down"? Wow! You must have had a horrible childhood, or been treated very badly by men in your life to have such hatred of men, and the women who cherished their roles as mothers. My mother wasn't a June Cleaver to the letter, but was similar in many ways, and was available to offer support, guidance, and love. Always the love. None of my siblings or I were warehoused in day care while mom pursued a corner office. Her career was the family, and she took that role very seriously. Oh, and lest you still want to place my mother in your "vacant minded" classification, she attended college when my youngest sibling started high school, majoring in art and education, and now teaches art appreciation at our local university branch.